If you’re worried about icy driveways and sidewalks with the temperature dipping, rock salt and ice melt are quick fixes. But these products can have a downside. There are plenty of reasons to take care with how much ice melt you use and exactly how you use it. “When it comes to ice melt, the brand really doesn’t matter. They’re all basically one of three compounds: sodium chloride, magnesium chloride, or calcium chloride. 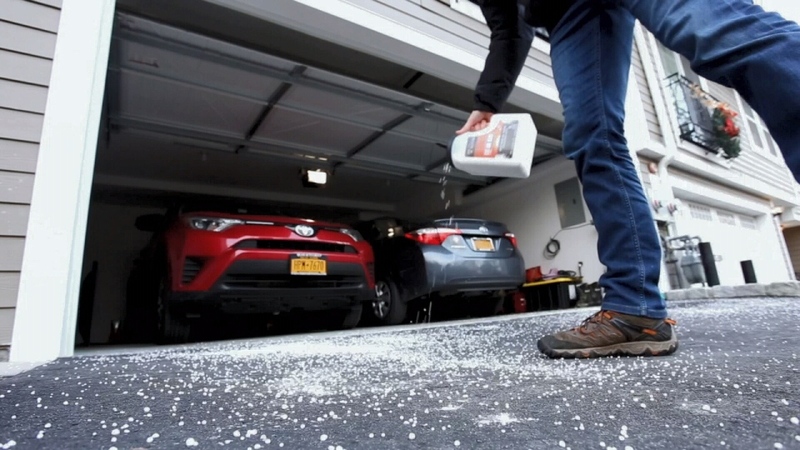 They work slightly differently, but at the end they’re all salts and they can cause the same damage,” explained Consumer Reports home editor Paul Hope. Salt can seep into porous pavement, damaging walkways and driveways. Plus, it can harm plants and your pet’s paws. And be skeptical about ice melts claiming to be environmentally friendly. “Manufacturers of ice melts with a coating on them may claim their product is less damaging, but practically speaking, they’re not. Once the coating wears off, you’re left with just salt anyway,” said Hope. Be just as wary of pet-friendly claims. Those products can be more expensive and they still might irritate your pet’s paws. A better plan is to set up a “rinse tray” at your entrance, so that after a walk you can wash any salt from your pet’s paws.